SO YOU TOO MUST ALSO BE PREPARED . . . This First Sunday of Advent is the beginning of our new liturgical year. During this season of preparation and anticipation, the Church focuses our attention on both comings of Christ - his "arrival" at his birth and his second coming at the final judgement. In our first reading (Isaiah 2:1-5), Isaiah prophesies about the end times when Jerusalem would be restored to its final glory and nations will no longer be at war with one another. 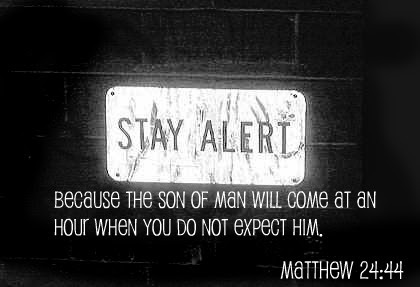 In our Gospel reading (Matthew 24: 37-44), Jesus prepared his followers for "the coming of the Son of Man" and admonished them to be alert and watchful. In our Epistle reading (Romans 13:11-14), St. Paul instructs his readers how to live in anticipation of Christ's coming, throwing off "the works of darkness" and putting on Chrsit. Brothers and sisters: You know the time; it is the hour now for you to awake from sleep. For our salvation is nearer now than when we first believed; the night is advanced, the day is at hand. Let us then throw off the works of darkness and put on the armor of light; let us conduct ourselves properly as in the day, not in orgies and drunkenness, not in promiscuity and lust, not in rivalry and jealousy. But put on the Lord Jesus Christ, and make no provision for the desires of the flesh! The early Christians thought Christ's coming was imminent. While it has been two thousand years of anticipation, that day and hour could be a thousand years from now or it could be tomorrow. The time and hour is not as important as the life we live in anticipation, in assurance and joy of what is to come. That is what the Advent season is about.